100% Polyester Jersey. 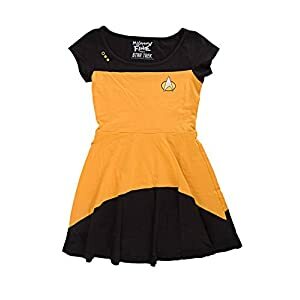 Short dress has short sleeves and an embroidered star fleet emblem. 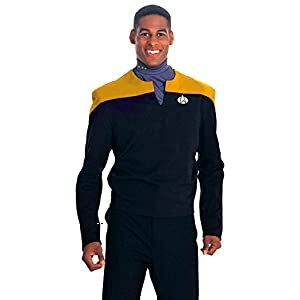 This look is from the 2009 star trek movie. 100% Polyester. Long sleeve shirt with attached black dickie and screen-printed communicator insignia. 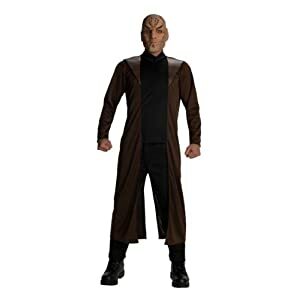 This look is from the 2009 star trek movie. 100% Polyester. Deluxe full-length black coat with tails and a faux fur collar. 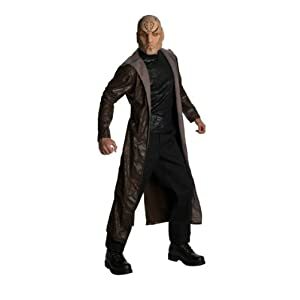 Also includes nero 1/2 mask featuring printed romulan tattoo-like detail. 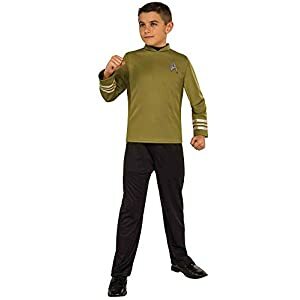 The newest Star Trek movie explores the back stories of James T. Kirk and Spock before they unite aboard the USS Enterprise to combat Nero, a Romulan from the future who threatens the Federation. 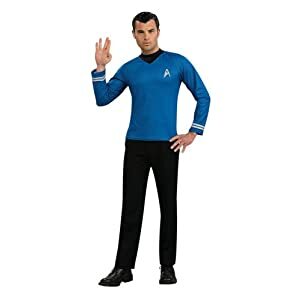 Costume includes shirt, dickie and black pants. Decorated with star fleet emblem. 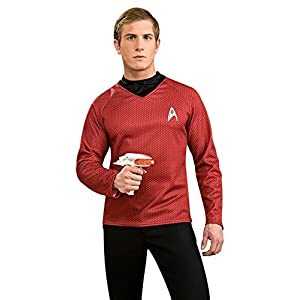 The newest Star Trek movie explores the back stories of James T. Kirk and Spock before they unite aboard the USS Enterprise to combat Nero, a Romulan from the future who threatens the Federation. 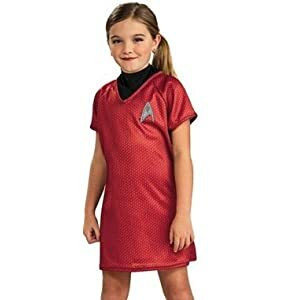 Child’s Small fits size 4-6. 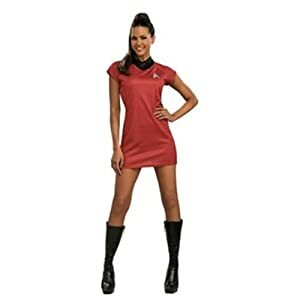 Be part of the crew with this red dress, comes with dickie. 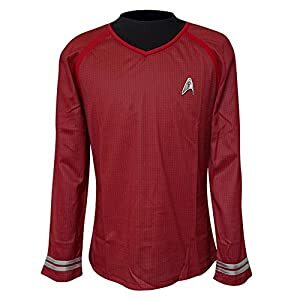 100% Polyester Jersey. 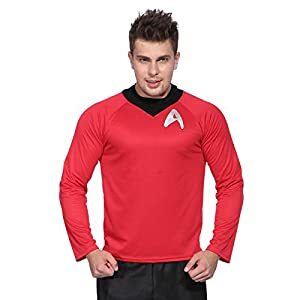 Long sleeves and embroidered star fleet emblem. 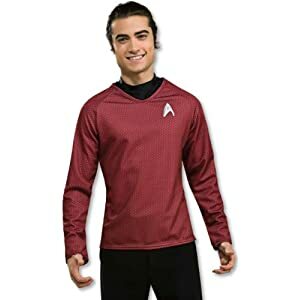 Includes a black under-shirt. 100% Polyester. 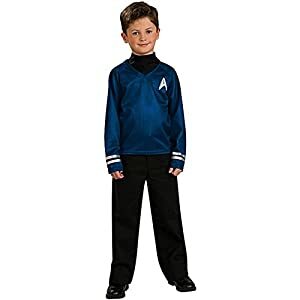 Long sleeve shirt with attached black dickie and an embroidered star fleet emblem. 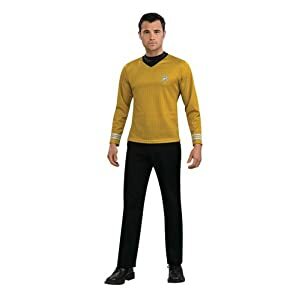 This look is from the 2009 star trek movie. 100% Polyester. Full-length black coat with tails and a faux fur collar. Includes a nero mask.